ETERNAL LIFE IS ETERNAL. It is NOT “life until you sin again.” Jesus promised us “eternal life” and it is ridiculous to think that He didn’t mean that He gives us life that would never end. Eternal life begins THE MOMENT when we believe. SALVATION IS A “BY BIRTH” SITUATION. A birth cannot be undone or reversed. “Once born, always born, Jesus did not teach a man must be born again and again and perhaps even yet again. We don’t have a second opportunity to be bom again physically, nor do we have or even need a second opportunity to be born again spiritually once we have received our spiritual birth. WE ARE KEPT BY THE POWER OF GOD. 1 Peter 1:4,5 teaches this. If it is God’s power that keeps us, who is stronger or more powerful than God? JESUS IS HOLDING US IN HIS HAND. John 10:28. We are not holding onto God; He is holding onto us! Even if we could let go, He cannot and will not. WE SHALL NEVER COME INTO CONDEMNATION OR JUDGMENT. John 5:24 teaches us this. As in John 3:16 and John 10:28 wherein we are told we will NEVER PERISH. WE HAVE ALREADY PASSED FROM DEATH UNTO LIFE. Now get this. According to John 5:24, the believer has already passed (past tense) from death into life. This cannot be speaking of physical life but must be speaking of spiritual death and life. We have never yet been dead physically but we were dead spiritually. THE BELIEVER SHALL NEVER DIE. In John 11:25 Jesus said to Martha that “whoever lives and believes in me shall NEVER die.” He surely was not speaking of physical death so He must have been speaking of a spiritual death. JESUS SAID HE WOULD NOT CAST US OUT. As in Hebrews 13:5 wherein Jesus said He would never leave us nor forsake us, He tells us in John 6:37 He will never cast us out. JESUS WILL LOSE NOTHING (THAT INCLUDES US). John 6:39 tells us that Jesus will lose nothing but “will raise it up at the last day, Whatever we are, we are something! This answers those who say He will not cast us out but we could choose to walk out on our own. WE ARE SEALED BY THE HOLY SPIRIT. When it is God who does the sealing, man cannot break the seal. The Holy Spirit is given to every believer to be with him and in him forever. 1 Corinthians 6:19, 20 teaches us that we are “bought with a price,” the blood of Christ. THE HOLY SPIRIT IS OUR “EARNEST. (GUARANTEE) OF OUR INHERITANCE. Titus 1:2 teaches us that God cannot lie and He has promised us eternal life. God said it; that settles it! GOD SAYS WE CAN KNOW WE HAVE ETERNAL LIFE. We are taught in I John 5:13 that the believer can “KNOW” that he has eternal life. How could he possibly know it if he could still wind up in hell? EVEN IF WE ARE FAITHLESS, GOD REMAINS FAITHFUL FOR HE CANNOT DENY HIMSELF. 2 Timothy 2:13 We are “in Christ” once we have believed. For Him to deny us, He would have to deny Himself. OUR SINS (ALL OF THEM) HAVE BEEN FORGIVEN. If all sins are forgive, how could any sin send a believer to hell? Acts 13:38, 39 says that ALL who believe are justified from all things.” To be justified is to be declared righteous. When Christ died for sin, it was for all sin (past, present, and future) . NOBODY (INCLUDING SATAN) CAN LAY ANYTHING TO OUR CHARGE. Satan may accuse us for what we have done but it was God who sent His Son to pay the penalty for our sins and it is He who declares us righteous. If God declares us righteous, who is Satan to say otherwise? Romans 8:33. NOTHING CAN SEPARATE US FROM GOD’S LOVE. Romans 8:37-39 teaches this clearly. “Nothing” certainly includes our sin. THE GIFTS AND CALLINGS OF GOD ARE WITHOUT REPENTANCE. Romans 11:29 Nobody can argue that salvation is not a gift. See Romans 5 and notice how many times the word “gift” is used in describing salvation. THE BIBLE DOES NOT TEACH THAT SALVATION CAN BE LOST. While there are numerous verses that some THAT TRY to use to teach that salvation can be lost, there are no verses that say such a thing. There are verses that teach subjects like “falling from grace,” “working out your own salvation,” “enduring to the end,” and “overcoming” which people try to use to teach the possibility of losing one’s salvation but this is not the case. Study those verses in their context and you will see they DO NOT teach a loss of salvation. Sadly, many have been deceived into believing their salvation can be lost, even though the Bible never teaches such a doctrine. You might ask: “How can this be?” While it is true that they have their verses they use to teach what is called “Conditional Security,” those verses are taken OUT OF CONTEXT. It all boils down to this: Those who BELIEVE are not condemned and those who have NOT BELIEVED are condemned already. (See John 3:18) Some think the doctrine of Eternal Security gives the believer a license to sin. Far from it! This doctrine frees the believer to truly live for God out of his love and gratefulness. 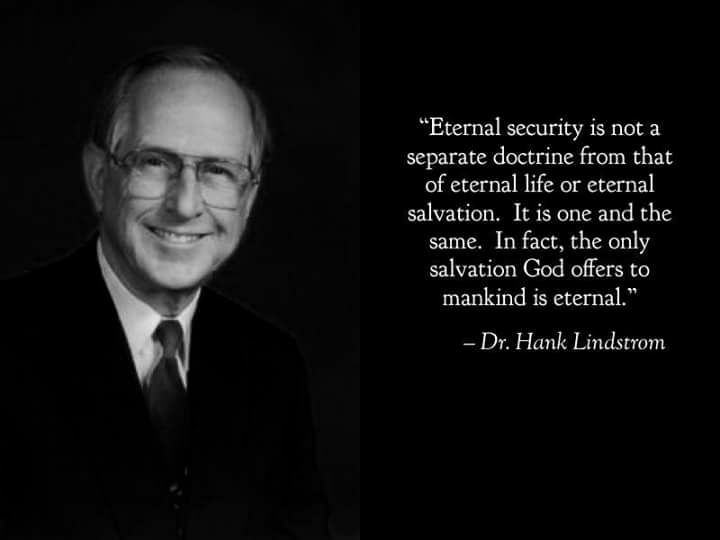 There are also those who think this doctrine of Eternal Security to be a doctrine separate from that of Salvation, yet I disagree. If being saved doesn’t ultimately land a person in heaven, what was he saved from? Instead of salvation, many actually teach we have a sort of probation-life until we sin so badly we cross the line and lose our salvation. What this amounts to is the fact that man continually looks for ways to put his own works back into the equation.